The wagyu beef cheeseburger at the Back Bar is juicy, well seasoned and cooked to rosy-pink perfection, with a crunchy layer of lettuce adding texture. There’s melted cheese, a warm, crisp sesame-seeded bun and gherkins, which, with the tomato chutney, give the burger a wonderful tang. Excellent. No fripperies here, other than unadvertised (but welcome) cheese. The charring on the still-moist patty reminds us of what wonders can be wrought by someone behind the grill who knows what they’re doing. The old-fashioned 100 per cent beef burger here wins for its perfect mix of meat, bacon, cheddar cheese, fried onions, mustard mayo and barbecue sauce: how burgers are meant to be. Chef Ryan Smith’s wagyu beef burger is a hero, ground daily from SA wagyu and strip loin, perfectly cooked with a good spice mix. It’s the pub’s signature and it’s worthy. 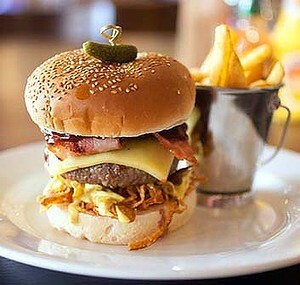 Size, freshness and innovation are all factors in the success of the Woolpack’s massive burgers. Babe the Burger tempts with its pulled pork patty, char-grilled apple, radish, watercress, horseradish mayo, taleggio cheese and red currant jelly. Gentler folks may light up when they see the size and calibre of The Vego Drama with its two huge slices of haloumi, roasted vegies, aioli and enough rocket to keep a family of rabbits happy for the evening.